You don’t need a gym to stay in shape. Gym memberships can be costly. Maybe the gym is too far away from where you’re at and the trip back and forth is just not worth it. I’m a full-time student and I get that. I can never keep up with a scheduled program because I’m out and about at the oddest times and finding a gym then is the last thing on my mind. That shouldn’t stop you from working out, though. This article covers some awesome home-workout equipment you should have in your arsenal! Some of these don’t require much space at all too and are suitable for small homes. The Total Resistance Exercise (TRX) is developed for your body’s overall muscles and strength. 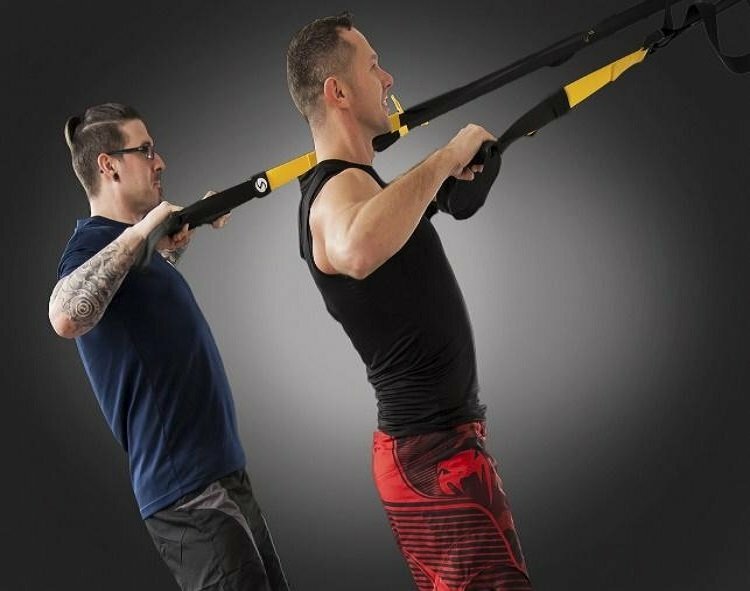 There are tons of workouts to choose from with just these two straps that leverage gravity. You can hook these bad boys up LITERALLY anywhere – from a tree branch at your park to your room door and you could work on every muscle group just as effectively as you would at the gym, using your own body weight. Wanna know what’s cooler? The TRX app helps you track your progress and includes workout tutorials so you don’t have to figure it out on your own. During workouts, coaches help you with the technique and offer real-time feedback! When it comes to cardio equipment, nothing comes to mind fast like a running machine can. And yes, now you can hire running machines for your home too! According to Runner’s World, the average person burns 100 calories per mile of running. The heavier you are, the more your burn. You can estimate the number of calories you burn by running by keying in your details into a running calculator. Aside from burning calories and trimming those love handles, running releases endorphins to your brain which helps beat anxiety and gives us a feeling of happiness. Yeap, the runner’s high. Wanna feel good after a stressful day? Go for a run! Can’t go out? Hop on a machine and you’ll still feel good about yourself. The pull-up bars designed for home use usually come in two forms: the ones where you have to screw to a wall, and the ones where you can mount it on your door frame and take them off whenever. If you don’t mind drilling holes in your wall, I suggest the former. However, if you’re renting your home, the second option might be the best choice. The portable ones are great too, because you can put them on the floor and use them as push-up bars and use the curved parts for doing tricep dips. You’re basically getting a 3-in-1 workout equipment. Full body movement workouts like pull-up’s are great for building strong back muscles, shoulders, and biceps. They help in fixing your posture as well if you have rounded shoulders from sitting in front of the screen all day. Having a good posture does wonders to your confidence and you’d be surprised by how your peers see you once you’re standing tall and upright! If you want a well-rounded cardio workout that works on most of your major muscle groups, you should really consider giving rowing a try. It’s not the first thing that comes to mind when people think of cardio, but do it right and trust me, you won’t regret it. Rowing works on your core as you have to stabilise yourself throughout the motion, as well as your quadriceps (front of your thighs), calves, chest, shoulders and back muscles. Do note that with rowing, you should focus on your form the first time around. Bad rowing patterns can lead to injury overtime. You can find many tutorials on proper rowing form on Youtube. Yes, you heard that right. You can reap plenty of benefits from rope skipping. It develops your mental focus, coordination, balance, and endurance. You’re not gonna get crazy muscular with this exercise, but you will be working your calves like crazy and get an intense burn if you’re doing it right and develop them. Rope skipping for 10 minutes is equivalent to running an 8-minute mile, according to Science Daily. You’re also doing your bones good as rope skipping helps in increasing bone density and the impact done to your joints is not as much as running as you land on both feet, thus distributing the force against your knees. Even if you don’t enjoy rope skipping, it shouldn’t be a big deal. You can get one for less than $10! Whether you’re working out for an intense burn or to just burn some calories, it is possible to do it right at home. “Can’t make it to the gym” is an old excuse. Now you can hire workout equipment and have it delivered to your doorstep from London to Cork via companies like Hire Fitness. There are, of course, plenty of other effective workout equipment you can choose from. What’s listed above is just the tip of the iceberg!